This photograph of gold nanoparticle suspensions illustrates the dependence of the sample's colour on the size of the nanoparticles going from red for the larger nanoparticles on the left to dark brown for the much smaller nanoparticles on the right. Bulk gold has the characteristic colour of the same name because of increased reflection of light at this end of the light spectrum. As the gold gets smaller and smaller it no longer reflects light in the usual manner (in fact this is because it becomes smaller than the wavelength of the light!) Instead, electronic interactions dominate. When the gold nanoparticles are sufficiently small they have a redish/pink colour (because they absorb green light) as can be seen in the sample on the left of the image. The nanoparticles become brown as their size is reduced further still (because they start absorbing red light too). This property of gold nanoparticles has been used since Roman times to stain glass – so nanotechnology is not as new as you might think! 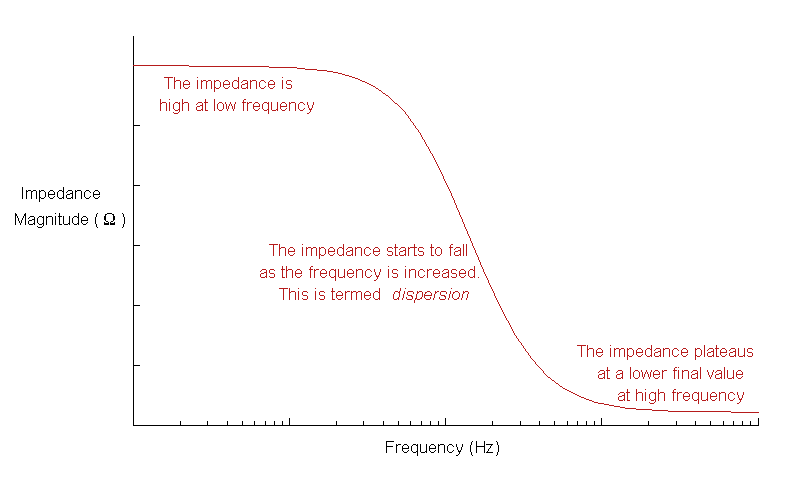 The impedance that a tissue exhibits decreases as the frequency of the applied signal increases. This is termed dispersion. When tissue changes from a healthy to a cancerous state, the way in which the tissue impedes the flow of current also changes resulting in an altered impedance profile. It is these differences between healthy and cancerous tissue that we aim to capitalise on so as to develop new opportunities for cancer imaging and detection. You can learn more about bioimpedance here. When cells change from a normal to a cancerous state different patterns of molecules, called biomarkers, can be found on the cell surface. By specifically targeting these molecular patterns diagnostics and therapies can be tailored to the specific cell state. Imagine the scenario in which an antibody to a particular biomarker is added to the surface of a gold nanoparticle. If a chemotherapeutic drug was also added to the gold nanoparticle it would create a means of tailoring chemotherapy so that only cancerous cells were targeted. Such an approach could help to alleviate some of the unpleasant and difficult side effects associated with systemic chemotherapy.